Hello and welcome back to Frightful Fridays! Today's monster is based on a horror straight out of actual, real-world nature. The heracleum mantegazzianum, or giant hogweed or hogsbane has sap that inflicts burns on skin when the sap is exposed to sunlight. I didn't have to do much to ramp up the terror for this plant beyond making it ambulatory. For extra fun, I added an even more fantastical variant. I hope you enjoy the wandering hogsbane, and I'll see you next week with another monster! This animated plant has a bright green stem, spotted with dark red and featuring clumps of white hair-like growths. The plant’s head is a resplendent cluster of white flowers. Phototoxic Poison (Ex) Slam or trample—injury; save Fort DC 19; frequency 1/round for 8 rounds; effect 1d4 Dex and 1d4 Cha; cure 2 consecutive saves. The save DC is Constitution-based. A wandering hogbane’s poison only takes effect in sunlight. If a creature is poisoned but not in sunlight, the poison can last for up to 48 hours, activating immediately when the creature is exposed to sunlight. Removing the poison before it activates requires an application of at least a gallon of water. Poisonous (Ex) Any creature that attacks a wandering hogsbane with a natural weapon or that grapples the hogsbane is exposed to its poison. If a creature adjacent to the hogsbane attacks it with a piercing or slashing melee weapon, the creature must succeed on a DC 19 Fortitude save to avoid being exposed to its poison. The save DC is Constitution-based. Wandering hogsbanes are aggressive protectors of their forest homes. Compared to many other sentient trees of their stature, they are incredibly short-lived, so they make the most of their limited time. While they are capable of speaking, they prefer action to debate. However, if a particularly persuasive druid or sentient plant commands them, they can exercise patience…for a time. When they are at rest, hogsbanes cluster together and avoid most other creatures. A typical wandering hogsbane is 27 feet tall, has a 2-foot-diameter trunk, and weighs 3,000 pounds. Wandering hogsbanes reach their full height in 2 years and live an additional 5 years beyond that. Inferno Hogsbane (CR +1): This variant wandering hogsbane has the advanced creature template. Its poison deals 1d6 Dex and 1d6 Cha damage, inflicts burn (2d6, DC 21), and requires 3 consecutive saves to cure. Its poison is activated by fire damage, as well as by sunlight. Additionally, if the inferno hogsbane takes fire damage from a spell or effect that affects an area, it releases a toxic 20-foot-radius cloud, requiring all creatures in the affected area to succeed on a DC 21 Reflex save or become exposed to its poison. Hello and welcome back for another Frightful Fridays! I had this one ready for a Friday posting, but I spent the day helping my youngest move apartments. I thought I would be able to get to this after the move, but I ended up passing out instead. Sorry for the delay! I've decided cats have been getting their due to much recently, so I'm switching to birds. The jackdoom is an animalistic amalgam of bird of humanoid, with very little of the humanoid features apart from the grabby arms (as seen below). While it tries to avoid combat, it happily grabs up prey and flings them from great heights. I hope you enjoy the jackdoom, and I'll see you next week with another monster. Thanks for reading! 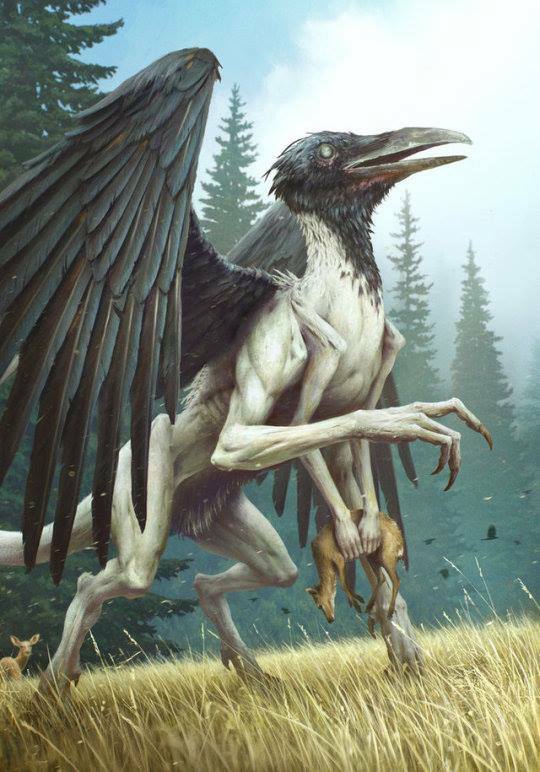 This towering creature is a strange mixture of corvid and humanoid, featuring a raven-like head and wings, muscular arms and legs ending in powerful claws and talons, and a pair of long humanoid arms. Extra Limbs (Ex) A jackdoom has an extra pair of arms. It can use items with these extra limbs, but it cannot wield weapons or shields with them. The arms grant a +4 racial bonus on grapple checks. Screech (Su) As a standard action, or as an immediate action when it knocks a creature unconscious with a melee attack, a jackdoom can unleash a horrifying screech. Creatures within 100 feet of the jackdoom that fail a DC 19 Will save become frightened for 1d4 rounds. Any creature that succeeds at this save cannot be affected by the same jackdoom’s screech ability for 24 hours. This is a sonic mind-affecting fear effect. The save DC is Charisma-based and includes a +2 racial bonus. A typical jackdoom is 35 feet in length from beak to tail. It has a 70-foot wingspan and weighs roughly 9,500 pounds. Jackdooms live for up to 40 years. Hello and welcome back for another Frightful Fridays! This week you get a cat. The outer cat is a highly intelligent being with an ego to match, so it forces people to build structures for it. Sometimes the buildings are monuments to the cats, and sometimes they're just designs that please the cats. They are dedicated foes to hounds of Tindalos but otherwise run from most combats. I hope you enjoy the outer cat, and I'll see you next week with another monster. Thanks for reading! This sand-colored cat has a squid’s tentacle for a tail, numerous smaller tentacles projecting from its mouth, and a squid’s mantle topping its head. Its eyes are the inky black of the lightless void. Languages Aklo, Common, Dwarven, Elven; telepathy 120 ft.
Accursed Poison (Su) Curse and poison—Injury; save Fort DC 22; frequency 1/round for 8 rounds; effect 1d4 Con drain and 1d4 Cha drain; cure accursed poison is both a curse and a poison and can only be cured if the curse is first removed, at which point the poison can be magically removed (or cured after 2 consecutive saves). Creatures reduced to 0 Charisma are killed by accursed poison. The save DC is Charisma-based and includes a –2 penalty. Create Spawn (Su) Humanoid creatures killed by an outer cat’s accursed poison rise in 1d4 rounds as mummies under the outer cat’s control. When the outer cat dies, the mummies become free-willed. The mummies do not possess any of the abilities they had in life. Hound Foe (Su) An outer cat gains a +4 racial bonus on attack and damage rolls against hounds of Tindalos. This bonus also applies to skill checks the outer cat makes when opposing a hound of Tindalos. Hounds of Tindalos within 20 feet of the outer cat are affected as if it were the focal point of dimensional lock. Impart Knowledge (Su) A creature dominated by an outer cat gains an enhancement bonus to its Knowledge (engineering) checks equal to the outer cat’s ranks in Knowledge (engineering)—18 ranks for a typical outer cat. The creature is also treated as trained in Knowledge (engineering). Permanent Creation (Su) If an outer cat uses major creation to create an object from stone or base metals, the object is permanent. Outer cats are a race of monument builders who used humanoid slaves on their home world to carry out their visions. The cats became envious of each other and commissioned the building of ever more ostentatious buildings and used their slaves to enact their proxy wars. Consumed with their rivalries and absorbed in their own egos, the outer cats were wholly unprepared when hounds of Tindalos attacked their world and wiped out most of the population. The surviving outer cats used their most personal monuments to enhance their teleportation abilities to escape their home world and travel to other planets. Outer cats took some lessons from their exodus. When they force slaves to build monuments, they limit their demands to a small region, and they often use mind-controlled intermediaries to lead construction. Outer cat buildings focus their teleportation abilities, so they can use an interplanetary teleport effect, allowing them to seed multiple worlds with their designs. Before they leave a world, they fill their buildings with guardians and accumulated treasure, for which they have little use. 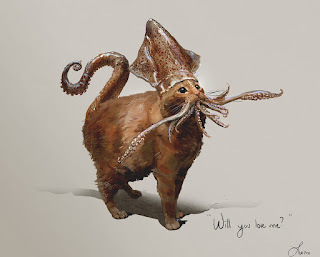 Some outer cats instruct their slaves to build angular, usually pyramid-shaped, constructions to draw hounds of Tindalos to them so they can attack their hated foes. Outer cats rarely enter combat against other creatures, and often use their abilities to coerce others into protecting them or to teleport away. When forced to fight, they use their poison-tipped claws to gain additional minions in mummies. They rarely use their claws to create mummies, since they prefer living humanoids, especially on worlds where undead are hunted, and they wish to remain hidden. However, when they are ready to depart a world, they create multiple mummies to fill their former constructions with guardians. Despite the cats’ shared experience and ouster, they refuse to cooperate with each other except when facing hounds of Tindalos. If two or more outer cats land on the same world, they engage in telepathic combat, with the loser forced to vacate the world as soon as possible. Outer cats that appear on worlds previously inhabited by other outer cats deface their predecessors’ constructions if they learn of them. A typical outer cat stands 2 feet tall at the shoulder, is just under 4 feet long, and weighs 50 pounds. It can live up to 300 years. It's been awhile since I've worked on a fey critter for the blog. With thoughts turning to fall, which is just around the corner, I was struck by the mental image of leaves swirling about in mini-tornadoes. It was not much of a leap to envision fey obsessed with autumn leaves, to the point they use them for protection and as weaponry. The razorwind gives up a measure of its natural/cursed invisibility to remain surrounded by leaves and becomes angry when it loses its coat of leaves. I hope you enjoy the razorwind. I'll see you next week with another monster! Dry leaves, in a panoply of autumnal colors and stained red and brown with blood, whirl about this unseen humanoid figure. Leafless Rage (Ex) This ability acts as blood rage (+2 Con, +2 Str, –2 penalty to AC), but only applies when a razorwind has lost its swirl of leaves ability. It can only end its rage when it restores the use of swirl of leaves. Natural Invisibility (Ex) A razorwind benefiting from its swirl of leaves ability only has concealment (20% miss chance). If it loses all its leaves, it benefits fully from natural invisibility. Swirl of Leaves (Su) Typically, a razorwind is surrounded by dozens of leaves which spin about its body. The leaves are exceptionally sharp and inflict 3d6 points of slashing damage and 1d4 bleed to a creature struck by the razorwind’s slam attack. A successful DC 14 Reflex save halves the slashing damage and negates the bleed. The save DC is Constitution-based. While leaves surround the razorwind, it gains a +1 natural armor bonus to AC and a +2 bonus to CMB for disarm attempts (these bonuses are figured into its stats). If the razorwind with swirl of leaves confirms a critical hit on an opponent, it can make a disarm attempt as a free action. If the razorwind fails a Reflex save against a spell or effect that deals fire damage, the razorwind loses swirl of leaves. If the razorwind succeeds on its Reflex save, it can voluntarily lose swirl of leaves if it takes fire damage to negate the fire damage. If a razorwind loses its swirl of leaves, either through taking fire damage or exposure to severe winds, it must find a square covered in leaves and take a standard action to restore the ability. Vulnerability to Wind (Ex) A razorwind is treated as two sizes smaller vs. wind effects. Additionally, when it is exposed to severe (31 mph) or stronger winds, it loses its swirl of leaves ability. Legend speaks of a group of fey responsible for decorating the halls of their nobles’ forest home with foliage found in the forest. They became so enamored with the array of colors presented by autumn leaves, they refused to part with them, even going so far as to ignore the nobles’ demands to do so. One of the nobles grew terribly angry with this refusal by subordinate fey and gave them one more chance to relent. Unreasonably attached to the ephemeral objects, they didn’t realize the danger they faced and rebuffed the noble once more. The incensed noble cursed them with permanent invisibility, negated only by their “precious” leaves, and threw them out of the otherworldly woods. These newly created razorwinds, or flense faeries as they are sometimes called, have a deep affinity for leaves, and they become furious when separated from them. Razorwinds inhabit old forests where they serve as guardians to the forests and the creatures inhabiting the forests. Dryads, who otherwise find the razorwinds’ bloodlust distasteful, call upon the creatures when threatened by lumber concerns and diplomatic avenues have failed. Razorwinds also attach themselves to intelligent plant creatures and enjoy spending their days with all types of leshys, preferably leaf leshys. If a leshy dies while under a razorwind’s protection, the latter creature absorbs the remains of the leshy to honor the fallen creature. A typical razorwind stands 3 feet tall and weighs 20 pounds. The leaves spinning about a razorwind make it seem larger, almost reaching human proportions. Hello and welcome back to another Frightful Fridays! I'm currently in Indianapolis for GenCon, but my past self was nice enough to remember to post this, so I didn't panic upon realizing I hadn't posted it. Hearkening back to the "Extreme" days of the 1990s, today's monster uses one of those supercool names gracing every other comic book cover put out by Image Comics. The deathstrike hydra is a terrible opponent at CR 14, and it can make multiple strikes with its cobra-like heads, even allowing it to make two attacks of opportunity for a single trigger. I hope you enjoy the deathstrike hydra, and I'll see you next week with another monster. Thanks for reading! Several lightning-quick serpentine heads, with fangs dripping green and sizzling venom, extend from this creature’s powerful body. All-Around Vision (Ex) A deathstrike hydra loses this ability if it only has one head remaining. Deathstrike Hydra Venom (Ex) Bite—Injury or Contact—Poisonous Blood; save Fort DC 24; frequency 1/round for 8 rounds; effect 1d6 Con; cure 3 consecutive saves. Fast Healing (Ex) A deathstrike hydra’s fast healing ability is equal to its current number of heads (minimum fast healing 10). This fast healing applies only to damage inflicted on the hydra’s body. Hydra Traits (Ex) A deathstrike hydra can be killed by severing all of its heads or slaying its body. Any attack that is not an attempt to sever a head affects the body, including area attacks or attacks that cause piercing or bludgeoning damage. To sever a head, an opponent must make a sunder attempt with a slashing weapon targeting a head. A head is considered a separate weapon with hardness 5 and hit points equal to the hydra’s HD. To sever a head, an opponent must inflict enough damage to reduce the head’s hit points to 0 or less. Severing a head deals damage to the hydra’s body equal to the hydra’s current HD. A hydra can’t attack with a severed head, has its Perception modifier reduced by 2, and potentially loses its all-around vision, but it takes no other penalties. Poisonous Blood (Ex) In addition to the usual ways to invoke this ability, an opponent that severs a deathstrike hydra’s head is sprayed with deathstrike hydra venom. Quick Strike (Ex) A deathstrike hydra with at least two heads can make an additional attack for a given opportunity. A second attack counts as two attacks for purposes of Combat Reflexes. The hydra can make an attack of opportunity against an opponent that misses a melee attack or fails to sunder one of the hydra’s heads. Additionally, if a deathstrike hydra succeeds on a bite attack, it can make an additional attack with that head at a –5 penalty. This counts against the attacks it receives with Combat Reflexes, and it only receives one such additional attack per head. Regenerate Head (Ex) When a deathstrike hydra’s head is destroyed, two heads regrow in 1d4 rounds. The hydra cannot have more than twice its original number of heads at any one time. To prevent new heads from growing, at least 20 points of acid or fire damage must be dealt to the stump (a touch attack to hit) before they appear. Acid or fire damage from area attacks can affect stumps and the body simultaneously. A hydra doesn’t die from losing its heads until all are cut off and the stumps seared by acid or fire. Vicious Bite (Ex) A deathstrike hydra's bite attacks threaten a critical hit on a roll of 18–20. If the hydra scores a critical hit on a target, it deals 2d6 bleed in addition to twice its bite damage. Modified from standard hydra stock by druidic serpentfolk transmuters, deathstrike hydras marry a king cobra’s deadliness to the hydra’s formidability. The resulting creatures are supremely quick, even more foul-tempered, and highly venomous. Their heads lash out with incredible speed, allowing them to attack opponents twice in rapid succession with a single head. While they can become impatient in their attacks and strike speedily on the offensive, they are cunning enough to recognize when foes attempt to maneuver around them and reserve some of their attacks to thwart opponents trying to do so. Deathstrike hydras respect intelligent serpentine creatures and often ally themselves with such creatures. The hydras’ serpentfolk creators left safeguards in place to control them, since the irritable creatures often lose sight of who their allies are and attack everything in sight. 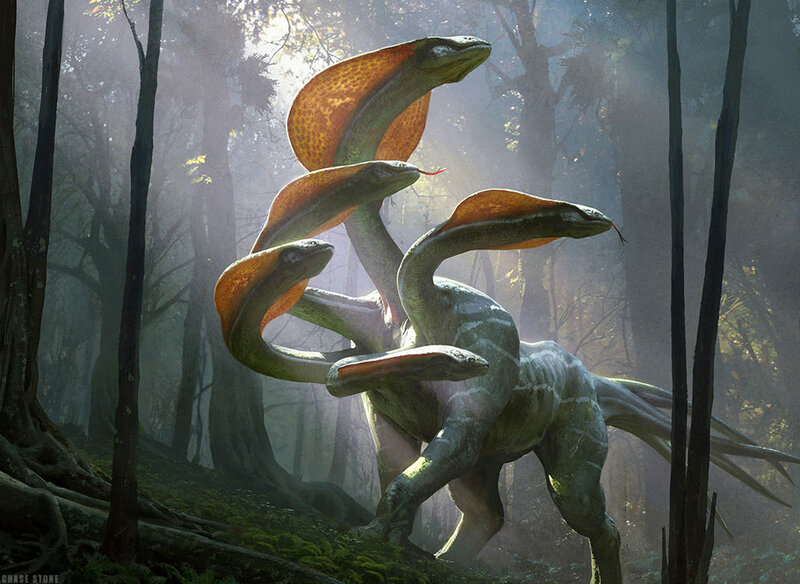 A typical deathstrike hydra stands 12 feet tall and measures 25 feet from head to tail. Caustic Deathstrike Hydra (+2 CR): A caustic deathstrike hydra’s heads each have a breath weapon (30-ft. line, 6d6 acid damage, Reflex half) usable in place of a bite attack every 1d4 rounds. The save DC is 10 + 1/2 the hydra’s HD + the hydra’s Con modifier. The hydra also adds 1d6 acid damage to its bite attacks. Additionally, the hydra is immune to acid, so only 20 points of fire damage can prevent its neck stump from growing new heads. Finally, the hydra’s poisonous blood also deals 4d6 points of acid damage. Snakehead Deathstrike Hydra (+1 CR): When a snakehead deathstrike hydra’s head is severed, the head becomes an independent advanced king cobra (Pathfinder Roleplaying Game Bestiary 2), which has DR 5/—. Additionally, if the hydra dies, all its current heads detach and become advanced king cobras with DR 5/—. The above variants can be combined. The snakehead deathstrike hydra’s independently created king cobras retain the caustic deathsrike hydra’s breath weapon.